Prepare yourself for tomorrow’s match against Zlatan and the LA Galaxy with match previews and player interviews, all conveniently available here. Cory Burke is goal hungry now. Check out the Union’s light blue 2019 adidas x Parley for the Oceans kit. It sold out in just one day. Our Union ✖️ @adidas ✖️ Parley kits are SOLD OUT on MLS Store. Union academy teams played the New York Red Bulls in preparation of the GA Cup in the next few days. The U15s won, U17s drew and U19s drew. United are bringing on 4️⃣ more Union Academy alumni to the 2019 roster. The Steel won last week and they’re hoping it’s a win they can build off of this week at home against the undefeated Charleston Battery. Here’s what head coach, Brendan Burke had to say leading up to Saturday night’s match. In the second leg of the CCL semifinal, Sporting KC lost to Monterrey, 5-2. The last MLS club has been eliminated as Monterrey advances to the finals on a 10-2 aggregate win. Yesterday, the LA Galaxy signed center back Giancarlo Gonzalez from Serie A’s Bologna. Watch 101 of the best goals in Major League Soccer history. 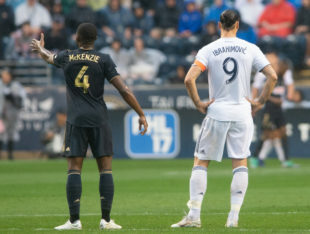 Speaking of goals, Zlatan is tied with Josef Martinez in goals scored in first 30 appearances. Here’s hoping he doesn’t pass Martinez this weekend against the Union. And what was once a race, Wondo Watch is more like a crawl as we’ve been waiting for him to score just one more goal since October 6, 2018. Landon Donovan has warned the USMNT, saying the Gold Cup is a tough tournament, especially in the group the USMNT finds themselves in. Predictions for the USMNT’s Gold Cup roster are already out. Here’s why women’s soccer is more than just the USWNT. At least 14 former high-level players have alleged that Canada Soccer and the MLS’ Vancouver Whitecaps failed to protect youth team members from abuse and inappropriate behavior by coaches. Three Chelsea fans were barred entry to the Chelsea vs. Slavia Prague Europa League first leg after describing former Chelsea and current Liverpool forward, Mo Salah as a “bomber” in a chant. Chelsea says that the club will “take the strongest possible action against them”. Chelsea beat Slavia Prague, 1-0. It’s time to start tackling racism in soccer in the strongest way possible. Atlético Madrid’s Diego Costa was given an eight-match ban for insulting the referee during the club’s 2-0 loss to Barcelona. Best insult was a Spanish phrase that referred to defecating on the ref’s “prostitute mother”. Costa will miss the rest of the season and was fined €6,010, while the club was fined €2,800. On a happier note, here are 10 things to look out for in the Premier League this weekend. Lots of hand wringing about the state of MLS with its uninterrupted record of capitulating to LigaMX teams year in and year out in CCL. Not sure how it’s any more complicated than payrolls. Monterrey’s squad is worth almost 4-times what Kansas City’s is. Even MLS’s biggest spending club, Atlanta United is worth a bit better than three quarters of Monterrey (73 million pounds to 58 million). In order to win outside of any league you need quality depth, a fundamentally new concept in MLS which is just starting to get bench players better than the average USL quality. Lots of good, solid, well-run teams in Europe have ZERO chance of ever winning the Champions League, or even Europa League, even though they spend a lot of money. Your point about spending is valid, but what does MLS really gain by winning the title? Bragging rights? SKC would get destroyed in the Club World Cup, and no one outside the federation cares about the CCL. I’m all for more spending, but I don’t think MLS should just cut all the strings just so we can finally beat MLS in the CCL. LAG are definitely the zinc of MLS. Parley sold out in 2 hours, for whatever it’s worth. Fans actually want a jersey that isn’t a white t-shirt. Hopefully adidas and MLS are taking notes.